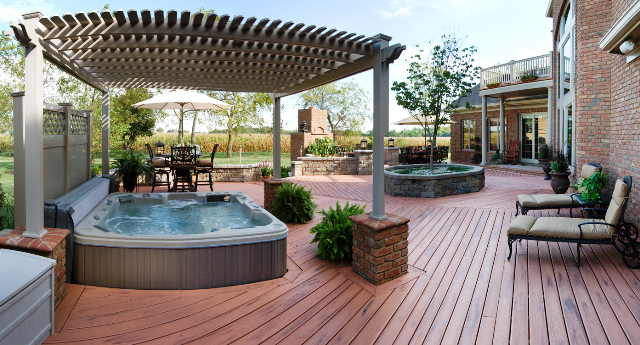 Archadeck of Columbus explores the realm of covered and screened patios including construction, benefits and costs. This elevated screened patio with adjoining patio below offers loads of low-maintenance qualities and aesthetic appeal. In keeping with the endless outdoor living opportunities present with a screened porch addition, many homeowners are opting for less traditional screened porch designs. Most conventional methods of screen porch construction consist of being built on “top” of some kind of deck-like structure, be it wood or composite. 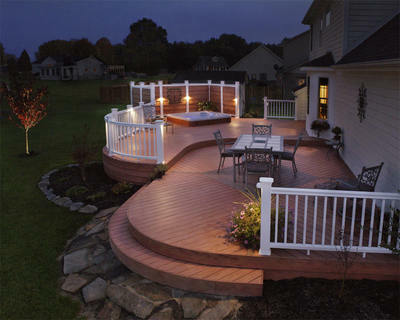 However Archadeck of Columbus has built many screen porches and open porches over concrete pavers or hardscapes. These are generally referred to as screened patios, or covered patios with the only difference essentially being the grade of the structure and floor medium used. 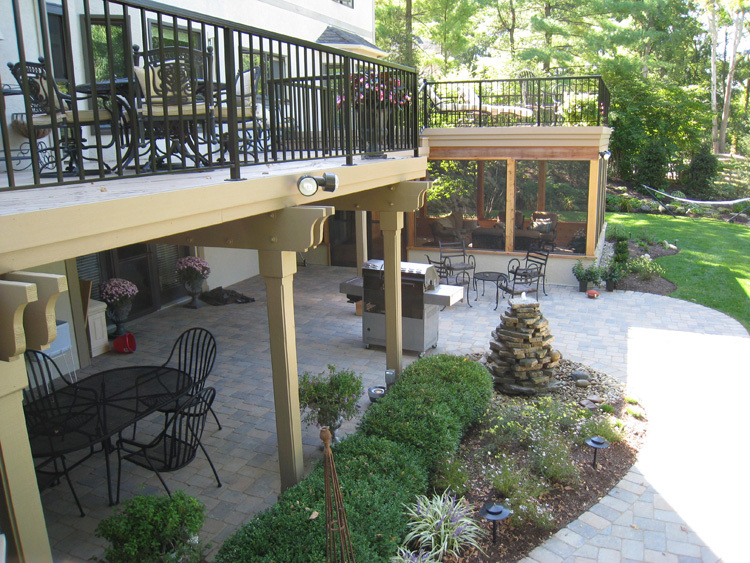 Paver and hardscape patios can make a wonderful screened or covered/open porch addition. These outdoor living spaces are often built on the ground, or at a lower grade than traditional screened porches, but can also include an elevated design. Screened or covered patio construction begins with planning the corner columns of the structure. Here we install a standard footer set in concrete to secure the columns and create a base from which the structure is built out. In this part of the country we typically install these footers at 3 feet in depth due to freeze lines. Once the footers are installed, they serve as the base from which the rest of the structure is built. This includes the walls, rafters, roof and remainder of the structure. In constructing some of our screened or covered patio designs from scratch we will often extend the paver or hardscape out past the covered portion. This will allow a good transition and add valuable outdoor living space too! This screened patio in Columbus, OH is built using a mix of dimensional pavers and rustic cedar interior trim. Often the question may arise, how do we adhere the walls when knee walls are present in the design? The answer is simple: we attach the walls to the pavers themselves with concrete fasteners. Another viable consideration is how do you combat the undulation of some pavers or hardscape mediums? When choosing a paver the homeowner needs to keep in mind the different paver textures. Using a hardscape material with varied undulation is actually no different from the undulation or character of a decking board — because no two are exactly alike. 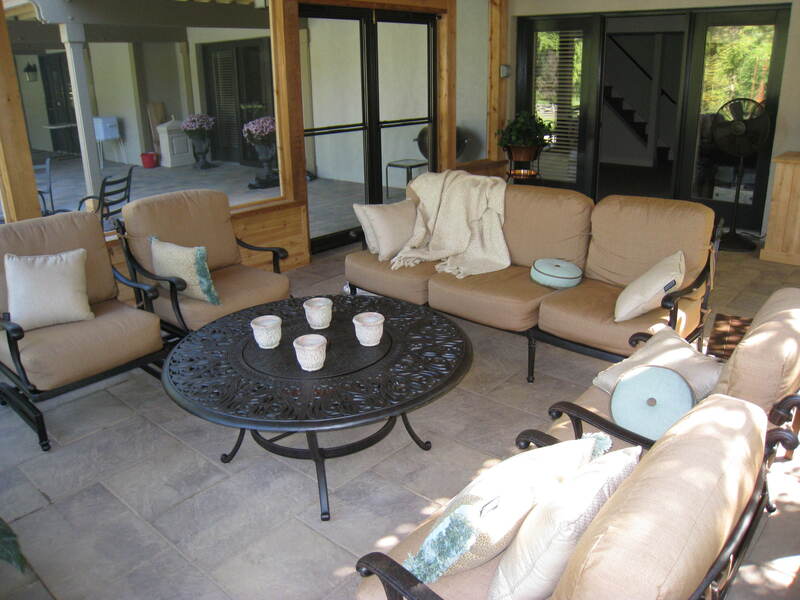 There are many reasons homeowners choose a screened patio or covered patio design. These include the low-maintenance qualities tied to using a hardscape floor. Pavers and hardscapes are easy to maintain and to clean. Hardscapes are also strikingly beautiful from an aesthetic standpoint, and homeowners like to tie their screened or covered patio into a new or existing patio space as well. The mixture of wood and stone is also appealing aesthetically to many homeowners. 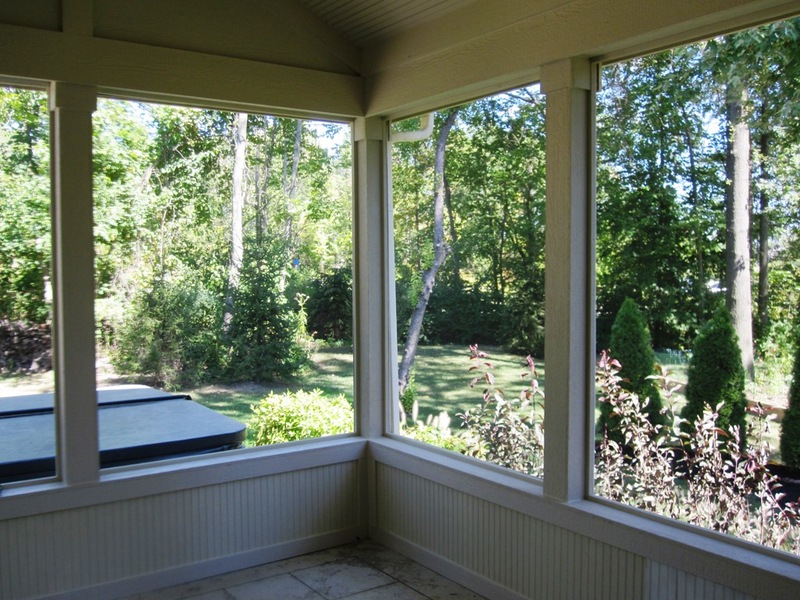 This screened patio in Columbus, OH opens onto a covered patio which increases valuable outdoor living space. You can also add a porch over an existing patio—this is done by installing footers which requires removing sections of the existing patio, setting posts, back filling and reinstalling the pavers. Portions of the pavers or hardscape of your existing space will have to be removed but once the porch is done, you won’t be able to tell. Our renovations look original once completed. The price of adding a screened patio or covered patio all depends on the elevation of your design and the hardscape flooring you choose to use within the design. You can have it built two ways, either low-to-grade, which is essentially on the ground or elevated. 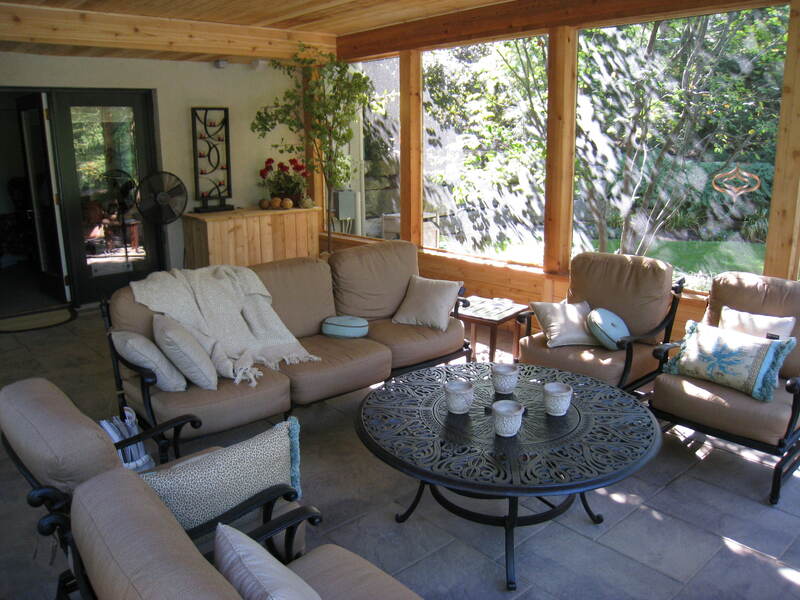 Elevated screened patios generally cost 20% more than a regular elevated screened porch. The increase reflects the construction dynamics involved which consist of layers of aggregate that are necessary in patio construction. 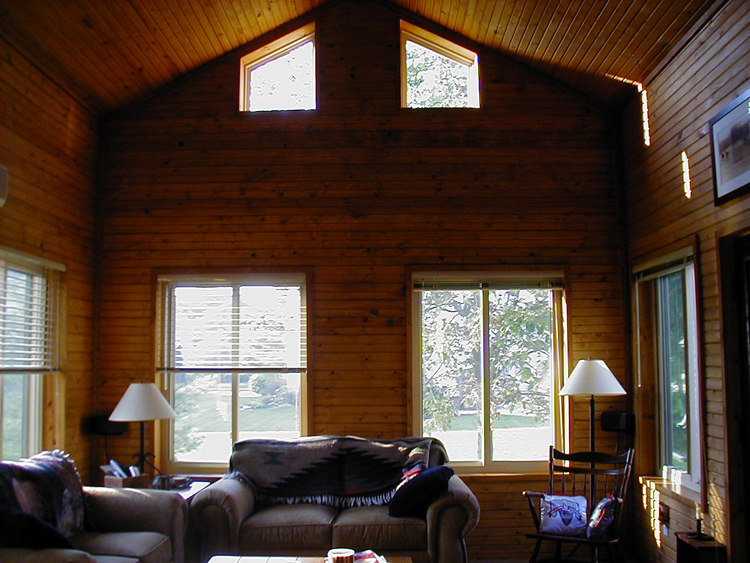 Low-to-grade designs usually cost approximately 10% more over standard screened porches built using wood. This increase may be non-existent or even a decrease when compared to screened porches built with higher-end solid PVC decking or its counterparts. Just like a savory recipe, it is the ingredients that go into an outdoor living design that make the difference, and reflect the costs involved. Please visit our patio and hardscape photo gallery and our outdoor living photo gallery located on our website to see more of our fabulous Columbus area hardscape designs! 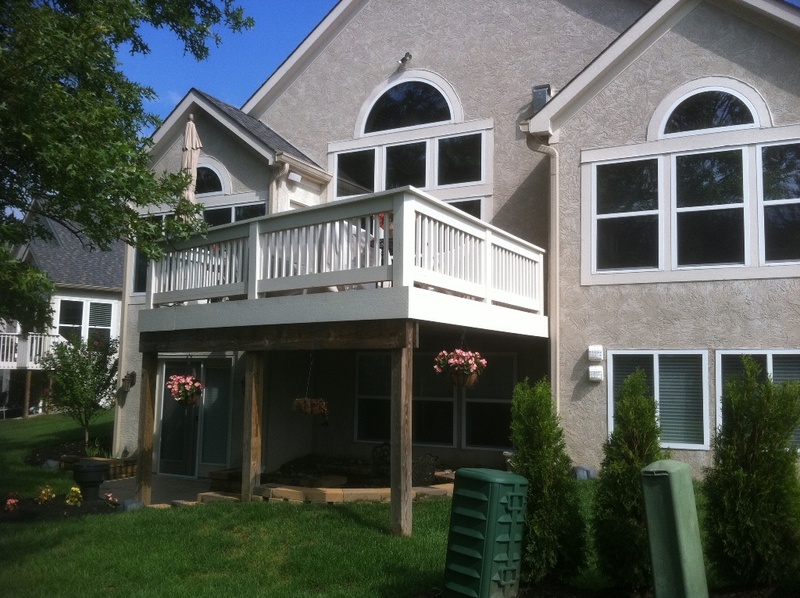 Challenges in placement and roof style of adding a porch or sunroom to the back of your home. A case study in Columbus. Do you know all the factors that affect where you can build a deck or porch or other structure on the back of your home? Read this article to learn about these factors. Oh, the challenges we face. Many of my customers decide they want a new structure whether it be a deck or porch or sunroom. They go to the back of their house and decide exactly where they want it to be. Then I show up and often feel like the bad guy because I have to present a list of reasons why that won’t work. I don’t want to be a downer but my job as a professional builder is not to jimmy rig something to fit where it doesn’t fit but to tell the client why that will or won’t work. When deciding where to place an outdoor addition, we need to consider existing windows and roof lines so the new structure will work aesthetically and functionally. Windows as challenges in attaching new roofed structures. When attaching a new structure, we cannot attach the roof where windows sit. Often the placement of the second story windows makes this a huge challenge especially as it relates to attaching a roof. 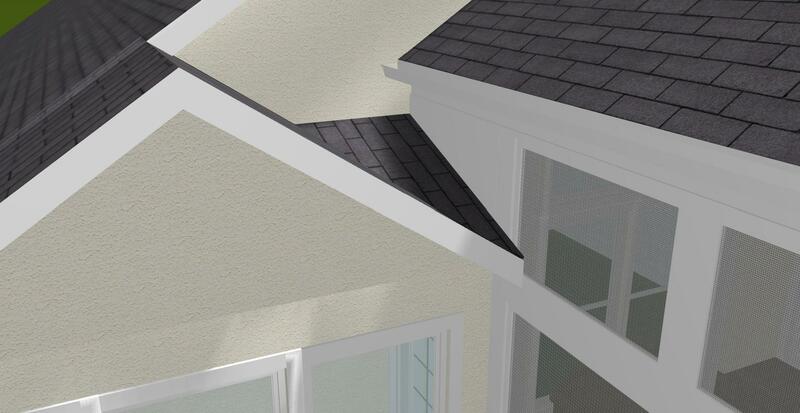 Depending on the style of roof (Gable, Hip or Shed) we have to accommodate this by either keeping roof line below the window(s) or building the new roof to cover them. Another aspect homeowners should consider is how much light will be obstructed with a new roof. Another big consideration is the direction of the back of your home. Will your new structure get lots of sun or very little? How will that sun affect the light that enters the back of your house? You may love the way the light pours through the windows on the back of your house – at the very spot where you want your new sunroom or porch to go. The porch will then enjoy that streaming sunlight but your light inside the home will be affected. But I want you to be happy year after year in your new porch or sunroom. I don’t want you to feel like you made a mistake because of how it changes the amount of light in your favorite room. 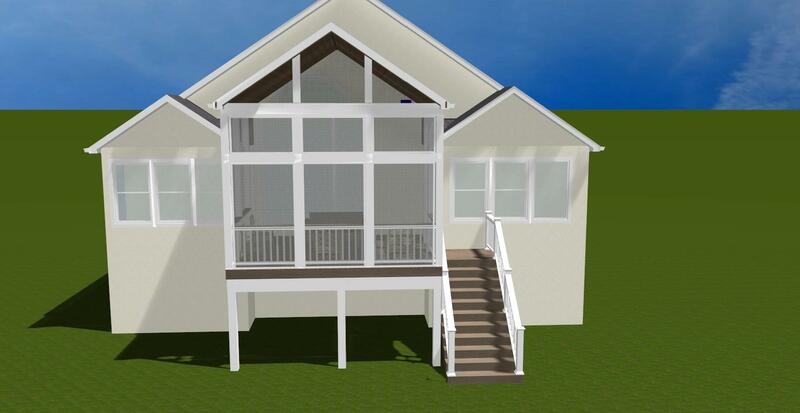 I don’t want to build it in such a way that the sunlight is so overwhelming on one side of your porch that you only want to use it at certain times of day. I treat you like I would my brother or family member. I want to use my experience to guide you in making the best decision. Take a look at the picture below showing the back of this home. The family wanted to convert their deck into a screen porch. Looking at the back of the home, it’s pretty much of a no brainer right? The obvious choice would be to put the screen porch where the deck was. And, also obvious was to use a gable roof. We always want to make the roof style fit with the home. In this case, you can see 3 gable roofs on the back of the home so using a gable style would fit right in. In addition, using a gable was perfect because it would extend over the existing half dome window and not cause any problems with other windows. As it turns out, there was quite an architectural challenge in designing this screen porch. The first challenge was that the gable roofs on either side were a different heights and pitches so we needed to design something to work well with both adjacent gables. One of the larger challenges that an inexperienced contractor might not think of was water drainage. If you look at the adjacent gable roofs and imagine the screen porch abutting up to them, the water coming off those other roofs is going to flow right down into the screen porch. Take a look at how this design would work if no accommodation was made for the water flow and appropriate drainage. 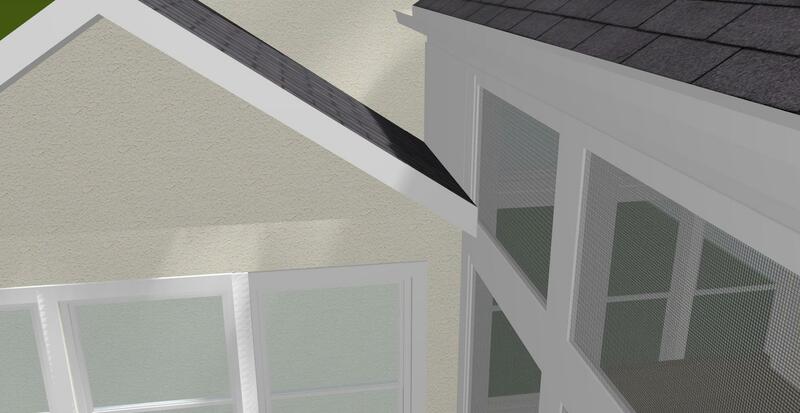 In order to fix that problem, we engineered cricket roofs to divert running water away from the screened porch. As noted above, working with architectural elements on the home can be a challenge and is a major factor in the design. This home not only had a large elevated half-round window that they wanted to keep but they also had a vent on the back of the house that we needed to work around. As you can see in the final design below, we were able to accomplish all of the architectural challenges while still creating a stunning structure that would look like it was built with the original home. You can see how the gable roof fits in beautifully with the architecture of the home. You can also see how the screened porch is finished to match the look of the room to a tee. Our work at this Delaware home is in progress so we look forward to sharing pictures once we’ve finished. One thing that isn’t apparent in this picture is matching the materials. Often one of the first questions people ask me is “Can you make it look like it was made to go with our home?” The answer almost all of the time is yes. We hunt down roof shingles, paint colors, siding, gutters and other materials to match your new structure to your home. 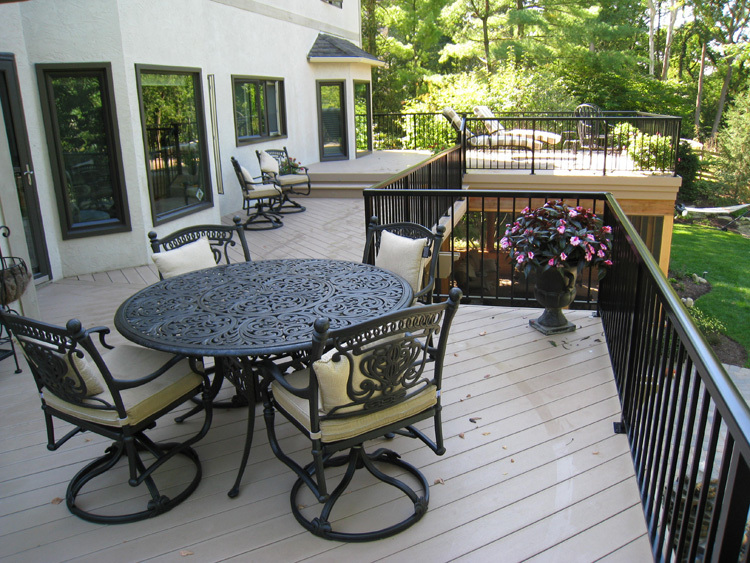 The deck of this home used Trex composite decking. We were able to extend the stairs by using the same decking material for a perfect match. On this particular home, we are working with a stucco exterior. Stucco is a challenge because it is thin mortar and is brittle. When attaching the structure to the home, very special care and attention is paid to working with the stucco on the home’s exterior. 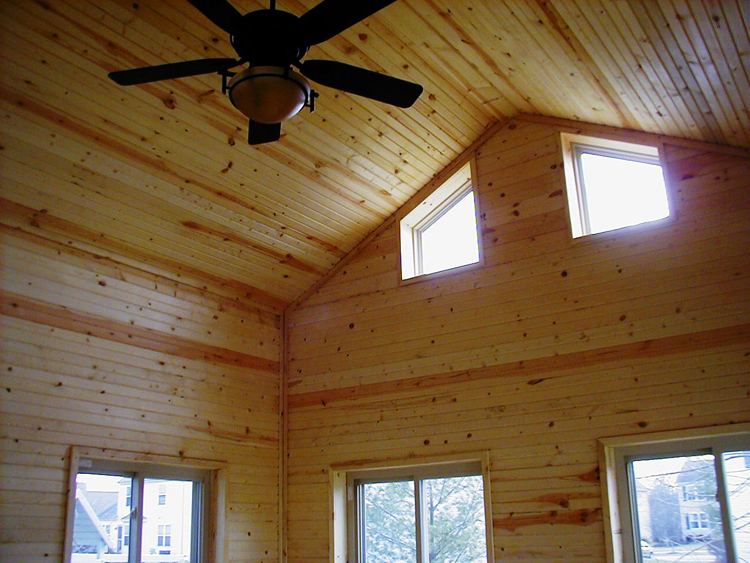 As we mentioned before, adding a roofed structure to your home will affect the light into your home. In many of our screened porches and sunrooms we add Velux skylights. These not only bring more light into your new room but allow for more natural light into the adjoining room in your home. As you can see, it’s really important to work with an experienced outdoor builder. You might not want to work with a general contractor unless they have extensive experience in building outdoor roof structures. It’s a fair question to ask specifically how many screen porches or how many sunrooms they have built. When you are meeting with the builder, make sure they ask you a lot of these types of questions. Any contractor that takes a quick look at it and says “yup I can do it” is almost certainly not one you should work with. Also make sure that your builder is going to give you a design drawing. One person’s interpretation of specs can be a lot different than another’s. You want to make sure that you and your builder are on the very same page. 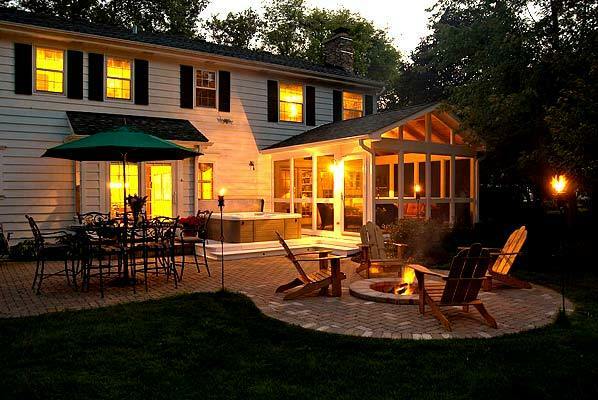 We build throughout the greater Columbus area and would love to talk to you about a screen porch or another outdoor addition you are planning for your home. Give us a call at (740) 879 – 3730 or email us at. westcolumbus@archadeck.net. Please also feel free to take a look at our website. You can see hundreds of great pictures of all sorts of outdoor projects. Author archadeckofcolumbusPosted on December 9, 2011 Categories Design and architectural building challenges, screen porch, Screen Porches Columbus, Screen Room Columbus OhioTags Archadeck of Columbus, Colubmbus screen porch builder, Columbus screen porch architecture, Converting your Columbus deck to a screen porch, Roof style Columbus screen porch1 Comment on Challenges in placement and roof style of adding a porch or sunroom to the back of your home. A case study in Columbus. 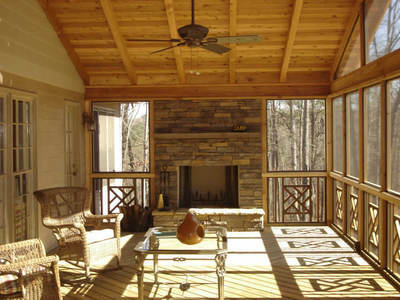 Archadeck of Columbus explores the interior design options and considerations in screen porches, 3 and 4 season rooms and sunroom additions and how they can harmonize so effortlessly with your existing home. Wouldn’t you love to have that room addition you have always dreamed of? A place to relax, read a book, take a nap or even a room where you can watch the sun fade into the horizon. Nowadays room additions don’t have to be “plain Jane” sheet rock with four walls and no pizzazz. Room additions can come under the guise of many other titles, like sunrooms, 3 and 4 season rooms and even screened porches. Any room that is attached to your existing home that serves to improve your way of life can be a room addition. That being said we are going to explore the interior design options that can be incorporated into various room additions. When we refer to the term interior design, this does not mean you have to be a licensed interior designer with an association like ASID ( American Society of Interior Designers) in order to turn your room addition into a work of art. The first vital observation to make is to what extent you will be able to trim out your structure and what medium would be appropriate for your structure. This depends solely on what type of structure you choose to build. For example, a screen porch interior can be trimmed out with a myriad of beautiful interior details, but since a screen porch is subject to temperature variance and inherit moisture your interior design choices may be a little more limited than that of a sunroom, which is insulated. By adding insulation, windows and the HVAC you are in essence dealing with an interior room addition that just so happens to take its inspiration from the outside world around you from the beauty of nature and gives us the ability to coexist with that beauty from within an insulated, temperature controlled structure. A sunroom , also referred to as a 4 season room, addition to your home will come with endless interior design possibilities because having insulation and a consistent temperature free from the exposure of possible moisture will give you the ability to explore more options in flooring, ceilings, trim, wall finishes and even furniture and accessories. This screened porches interior design gets its inspiration from nature. Within a screen porch we are seeing many interior choices that reflect the rustic look. Rustic design options include exposed beams, rich deep wood tones used in the floors, bead board or ply bead ceilings, and even the addition of stone fireplaces within the structure. A good analogy is to compare the interior design options that are popularly used in today’s screened porches is a design that mimics a wilderness lodge full of earthy tones and hues that create a natural appeal for such a structure. Making sure your interior design choices are weather-worthy is crucial to the life and required maintenance of your screen porch here in Ohio where the winters can be quite brutal. 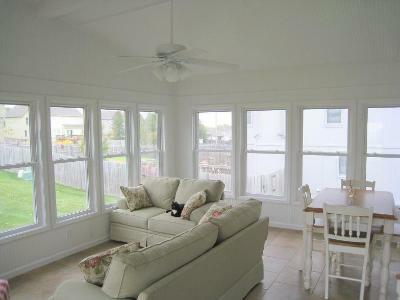 This four season sunroom has a beautiful tile floor. Once you move into the realm of the 3 season room addition more interior design choices will begin to unfold especially if you choose to build a structure that offers the option of convertibility by changing out the screens for windows when the weather changes such as an Eze Breeze convertible system. In doing this you will expand your choices for suitable design choices . More flooring, wall and finish options are within your grasp. The addition of windows to your 3 season room can open up a world of interior design possibilities. 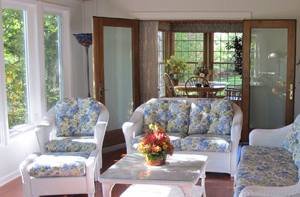 Notice how this sunroom flows effortlessly to and from the existing homes interior through these stunning french doors. A sunroom is the coup de grace of room additions. Sunrooms offer an extension of your interior living area that offers a bird’s-eye view of the outside. Sunrooms are insulated, heated, and cooled to keep the room and you at a constant comfortable temperature no matter whether there is snow on the ground or 100 degree temperatures outside. 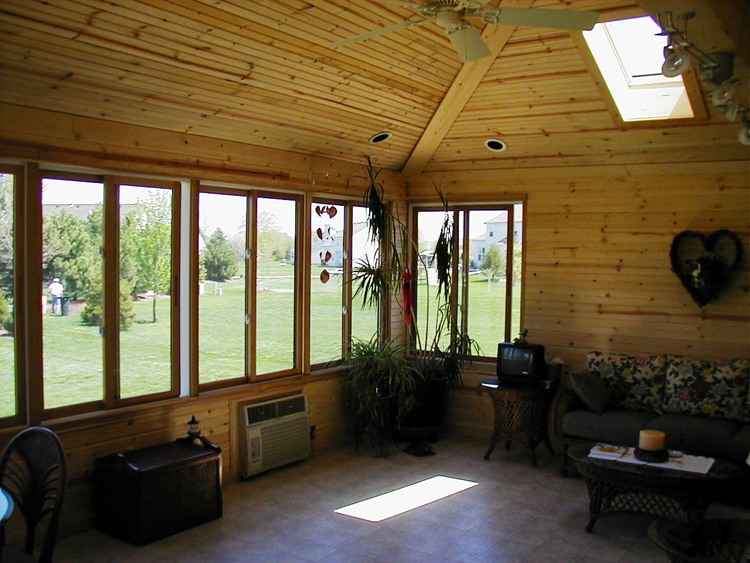 By choosing a sunroom addition you open all the choices in interior designs. With a 4 season room there is no danger of freezing temperatures causing flooring choices such as tile to crack. You also have the ability to trim your 4 season room with interior grade hardwoods without or without rugs used atop, wall-to wall carpeting, and even the popular laminate floors seen readily in today’s homes such as the popular Pergo laminate flooring. By adding the simple element of insulation to your room addition you have opened the door to endless wall finish options as well. Without insulation wall finish options such as crown moldings, faux finishing and even wallpaper aren’t possible because without insulation putting drywall in your room addition is not possible because of the presence of moisture. No matter what type of room addition you are thinking of, it is important to also consider the way the structure harmonizes with your existing home. Taking into consideration door swings, and traffic flow as you move from the addition into your existing homes interior is important to get the most enjoyment out of your room addition. Taking the functionality of your structure into view is also crucial, for example if you intend to use your structure as an extended room for dining and entertaining close proximity to your homes kitchen would be a necessity for utmost enjoyment. Imagine taking your morning coffee and danish on a sunroom alive with the first morning light, the whole experience can turn from mundane to moving just by your surroundings. Archadeck of Columbus takes it down the wall and to the ground focusing on the abundant flooring choice and styles available for your screened porch. 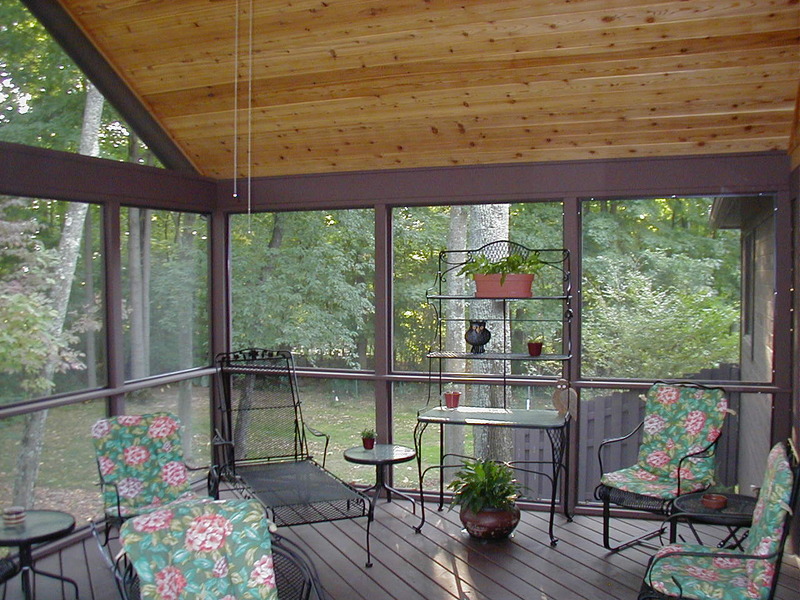 This stunning screen porch uses a divider rail, which conveys from and function in the design. 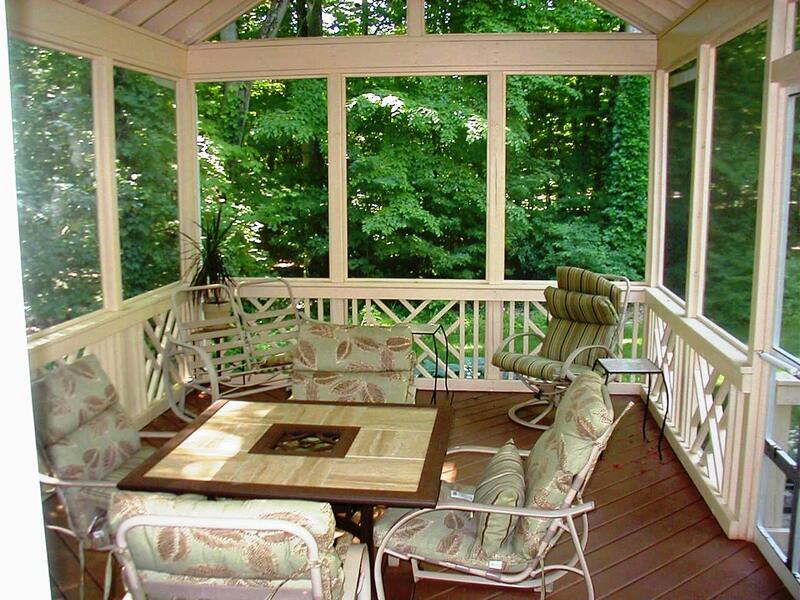 Screened porches can be finished with as much panache and flair as any other living area. Just because the screened porch is considered an outdoor structure as opposed to an interior structure doesn’t mean you have to skimp on style. You have to take into consideration the livable space an outdoor room such as a screened porch can add to your home, as well as your lifestyle. Last week we published a piece on the choices in interior screen porch ceilings https://columbus-decks.com/2011/09/14/interior-designs-on-screen-porches-so-many-choices/ this week we are taking it down the wall and to the ground by turning the spotlight on screen porch interior floors, from finish options to styles and everything in-between. 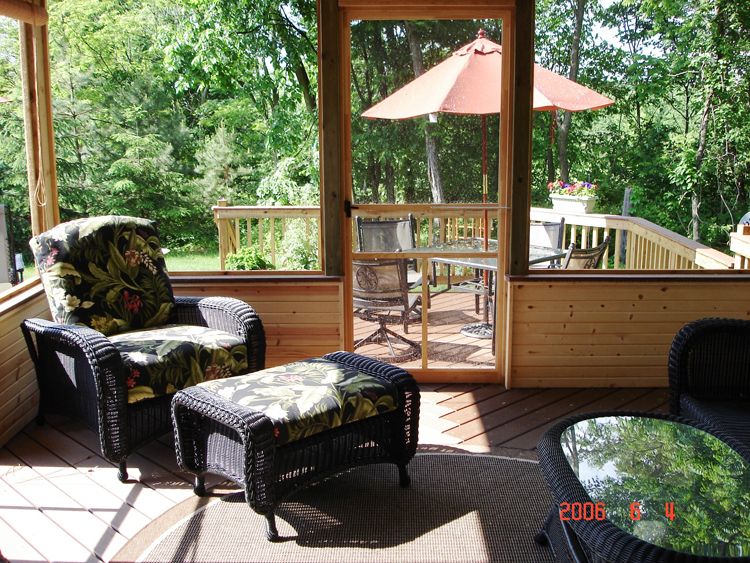 This screen porch by Archadeck of Columbus shows the use of diagonal decking boards and a divider rail. Wood, Tile or Synthetic? Most of the time we put a decking material down like pressure-treated (PT) pine, cedar or synthetic flooring. Considerations that come into play when choosing your flooring material may include plans to use the area for perimeter seating or dining. Most often the flooring material that is chosen by the homeowner reflects what is used on the interior ceiling or on the posts. Wood is a favorite plus, since it is under the cover of a roof you don’t have to worry about damage caused by rain, or sun exposure, as you would if the wood was used in an “open” porch setting. Some customers like to use area rugs to define seating or dining areas. The use of rugs is purely a cosmetic element used for aesthetics to convey the intimacy, unity and warmth of the structure. groove type of flooring, but these materials are more expensive when compared to other choices in flooring available. Tile floors– Homeowners always ask about using tile floors inside their screened porch. Tile can be beautiful and we are more than happy to put in a tile floor. Keep in mind that tile expands and contracts with the weather and temperature, and over time the grout will undoubtedly crack . Pavers are a good choice for people seeking that “old world” stone look without using tile. Pavers can be installed with less risk of cracking because we use a sand bedding as opposed to grout for installation. Keeping it real– When it comes to patterns, and which way to run your flooring it is a good idea to replicate the same pattern on your new screen porch that is used in the adjacent structures. Whether you use the same color or one that contrasts your existing structure, remember you want to make your porch look as though it was built when the house was constructed. 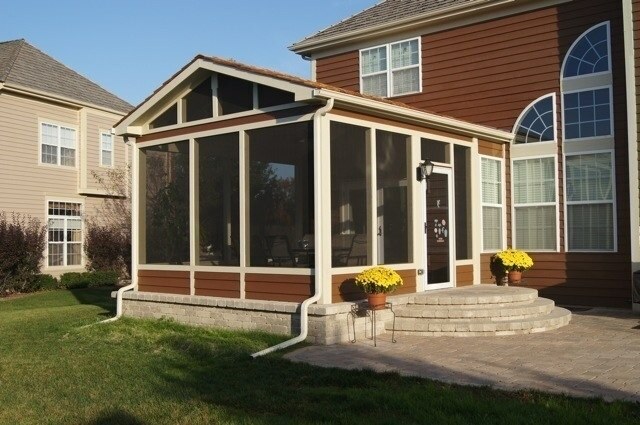 This screen porch by Archadeck of Columbus uses wrapped columns and a matching kneewall. Building codes– In most jurisdictions, any structure or floor that is 30″ above grade or more requires a barrier, which can be a rail or divider rail at 36″ tall. The view from your screened porch is important and at 36″ the rail will block your view somewhat when in a sitting position. 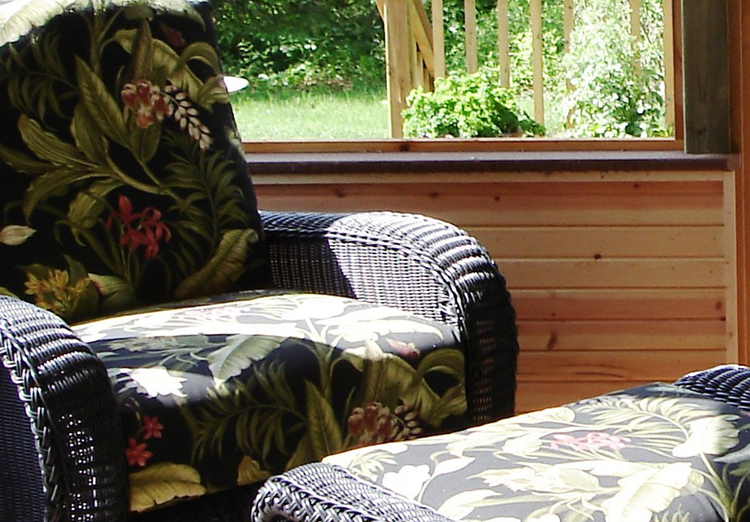 Rails can either be mounted on the inside or outside of your screen porch. If kids and pets are part of your scenario then it is usually best to mount the rails on the inside. This Columbus, OH screened porch has wrapped posts as well as a beadboard or plybead kneewall and a tile floor. for electrical outlets. Putting outlets in a rail is much more difficult and is not attractive. Kneewalls can also be finished in plybead and with a wainscoating design to add style to the kneewall itself. Some homeowners take advantage of the kneewall in regards to it’s shelf effect and display small decorative items as well. Divider rails– Divider rails allow for maximum visibility and also allows for an area to “break” the screen adding more strength. This added strength is especially helpful for families with small children and pets to protect the screen from damage. 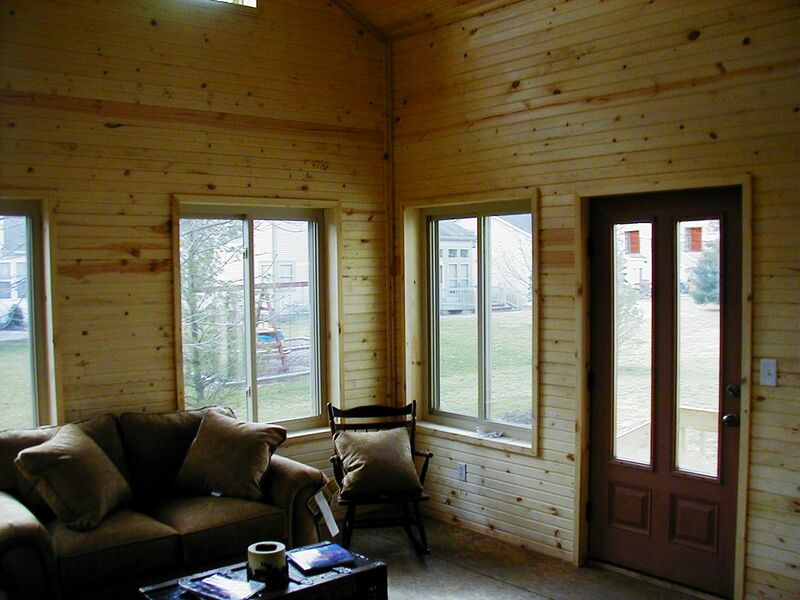 This screened porch by Archadeck of Columbus shows the beautiful use of a 24" knotty pine kneewall. To wrap or not to wrap– Choosing to wrap your posts gives a beautiful finished effect. Posts can be wrapped in a wide variety of materials including PT which can be painted in a color of your choice vinyl, cedar, pine and other rustic woods to allow continuity of design within the structure itself. Leaving the post exposed can lend to a more rustic and natural effect as well. Beauty is in the eye of the beholder and your posts can be finished in the medium that best suits your individual tastes. Another view of this gorgeous screened porch with knotty pine kneewall. Choosing the most appropriate interior flooring finish for your screened porch doesn’t have to be a daunting task. 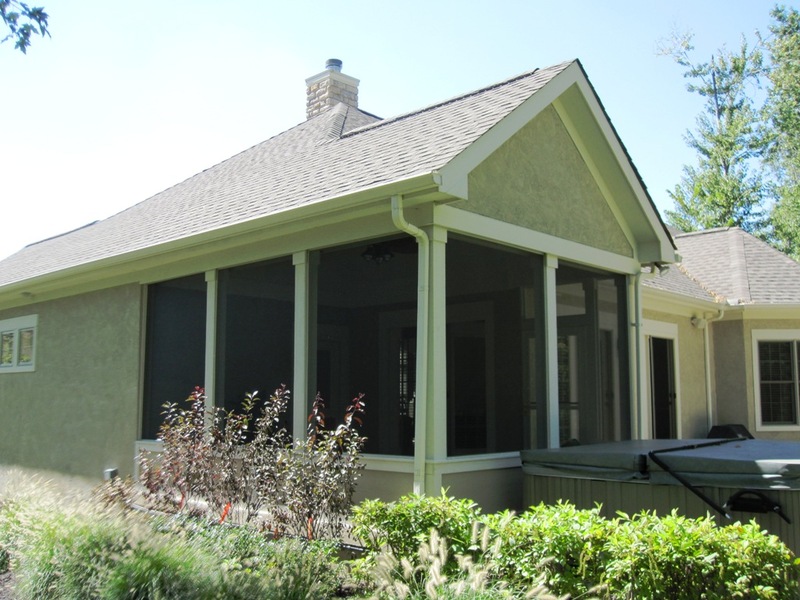 By using an experienced porch builder your journey of watching your screened porch reach fruition can be a magical experience, alive with design elements and textures to tantalize your senses.